A UNESCO world heritage site, Hampi was the capital of the Vijaya Nagar Empire. Situated on the banks of river Tungabhadra in Karnataka. The ruins of the palaces in Hampi, the temples and the royal buildings stand testimony to the wealth and grandeur of the Vijaya Nagar Emperors. The name Hampi derive from the ancient name of Tungabhadra river, Pampa, the daughter of Lord Brahma. The town locally known as the town of Pampa. The capital of the Vijaya Nagar Empire from 1336 to 1565, the city rule by four dynasties — Sangama, Saluva, Tuluva and Aravidu dynasty. The princes of these dynasties built more than 500 monuments. 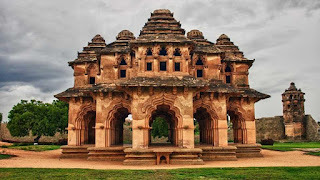 As a capital of the Vijayanagar Empire, Hampi grew as a trade center for cotton, spices, horse and gem stones. Gold and sliver use as currency. The Virupaksha temple is the most prominent building in Hampi. It believe that Lord Shiva married Parvati in this temple. Other attractions of this places are the Lotus Palace, Hazara Rama temple and Lakshmi Narasimha temple built in Vijayanagar style of architecture. The Hampi Utsav also known as Vijaya Utsav a cultural event organized by the Karnataka government in January each year. The festival of Purandaradasa Aradhana conducted at the Vithala temple is also famous. Celebrate to honor the poet composer Purandaradasa. There are many accommodation options in the city. Visitors can find many budget, mid range hotels and cottage with modern amenities. Karnataka State Tourism Department Corporation hotel is also a good option. There are many multi cuisine restaurants. Most of the restaurants serve only vegetarian food.